More steak!! Yum! 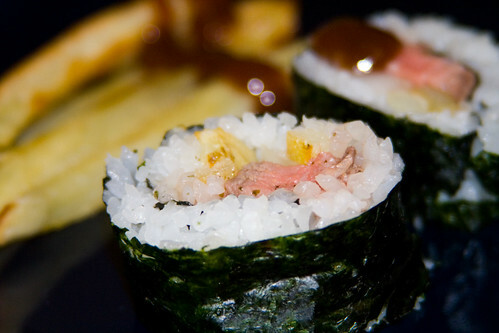 So now all you people who won’t eat sushi because you don’t like fish or any of that… you have no excuse!!!! Hehe. This uses the same flank steak recipe as the last post, so if you have leftovers, you can use them for this! Trim any excess fat from the flank steak. Pat the surface of the flank steak dry with a paper towel, then rub with the cut side of the clove of garlic. Season with salt, pepper, and garlic powder. Melt the butter in a skillet that is big enough to hold the flank steak. Put the flank steak in the skillet, and cook over medium-high heat until it is browned on the outside but still pink in the center. Remove the flank steak from the skillet and cover loosely with foil. Wash and peel the potato, and slice into 1/4″ x 1/4″ strips. Place the strips on a baking sheet and brush with olive oil. Bake for 25 minutes, rearranging the french fries halfway through so they don’t burn. Slice the onion into rings, cut these in half. 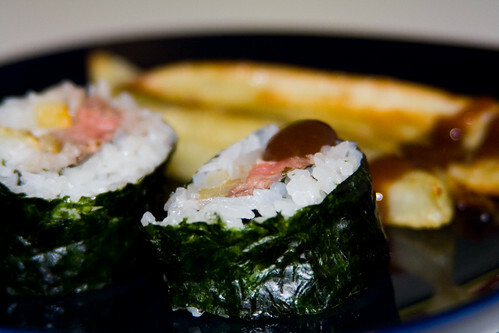 Roll the sushi, using a couple of strips of flank steak, onion, and french fries as your fillings. Serve with BBQ sauce. Enjoy! I love this recipe. Simple and yummy! If one has guests over for dinner, it’s wise not only to ask them ahead wether they like fish or not, but also how they feel about seaweed. Speaking of rolls for people that don’t like fish (sorry nori haters) I recently tried making a chicken wing roll and was quite surprised at how good it tasted. I had some left over wings and took a wing and got all the meat off of it. prepared my nori like anything else (I like making the inside out rolls so my rice is on the outside) and when it was time for the fillings I put a line of blue cheese down and then filled the rest with chicken wing meat. I guess I could of julianed up some celery but i am not a fan. Yum, that wing roll sounds delicious too! Steak in a roll, so good! Question though- do you find it chewy at all? Thanks! Yvo – 😀 The meat was really nice and tender, so it wasn’t really chewy at all! Soooooo good! yes you can use it in a post I would be honored. Yay! Thanks so much!! Hopefully you will see it up here soon! 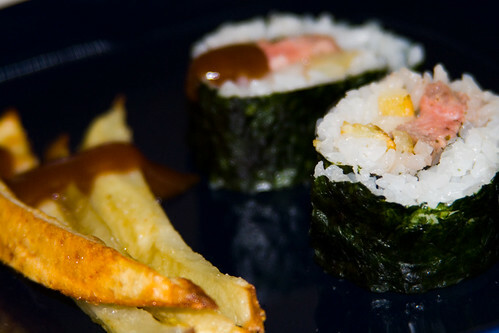 Hehe yeah, but I do have a few vegetarian sushi up here too… try the Kappa Maki, Firecracker Roll (although not for vegans), Inari-Zushi, Tamago Nigiri (another one that vegans can’t eat), Deviled Egg Sushi (also not for vegans), and the Monkey Maki (no vegans here either). 🙂 Hope that helps! melt shortening and chocolate in a pan over another pan with hot water(double boiler) cool. Sift flour with baking powder and salt. Beat eggs until light: add sugar then chocolate mixture and blend (stir together). Add vanilla and nuts. mix well. pour batter into waxed paper lined 8 inch square pan and bake at 350 degrees 30 to 35 minutes. cool and cut into squares makes 16. Enjoy I like to have a little french vanilla icecream on my brownies while they are still hot and drizzle a little raspberry syrup on them. If you like this recipe you may share it with others. 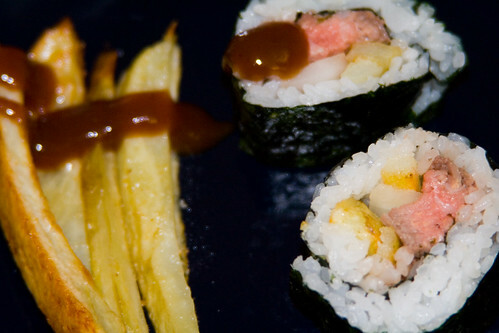 Try some fried sweet potatoe on your flank steak sushi with korean bulgogi bbq sauce it is exquisite in flavor…. Sweet potato and mac and cheese! Lol, weird? Sure but add a few things in the mix and you definitley will enjoy it even more! fat – Sounds delicious to me!